New York City commissioner Bill Bratton displayed the desperation of prohibitionists earlier this week, when he claimed that most drug violence in the city “is involving marijuana.” While such a ludicrous statement—which is actually an argument for legalization—can be disappointing, it is countered by the noble efforts of others in government. For the first time in recent history, a sitting U.S. 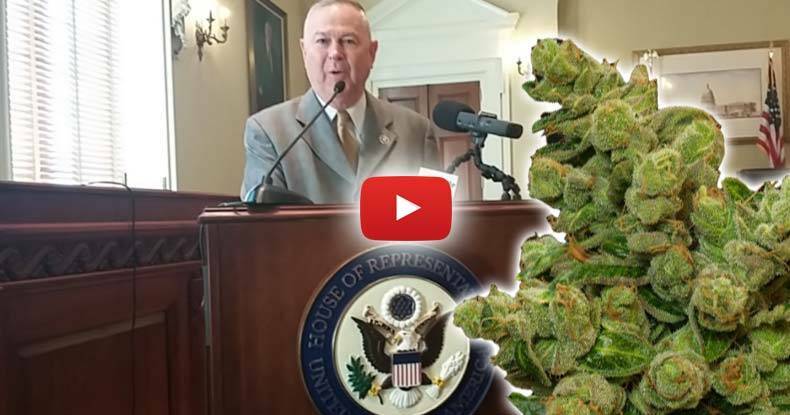 Congressman has admitted to using medical cannabis. Dana Rohrabacher (R-CA) made the comments at a meeting of the National Organization for the Reform of Marijuana Laws (NORML). The stunning admission is yet another sign that one facet of the war on drugs is quickly crumbling. The prohibition of cannabis has no basis in logic; it is instead founded on racism, corporate profiteering, and government corruption. A recent CBS News poll found that 90 percent of Americans support medical cannabis use, and 56 percent support the legalization of recreational use. The Free Thought Project has reported on a myriad of studies finding medical benefits in cannabis, through a part of human physiology called the endocannabinoid system which medical science it just beginning to understand. Because science and reason are breaking down the ignorance that sustains prohibition, 23 states and the District of Columbia now allow medical cannabis use, with four more expected this year. There is also a rumor that the U.S. Drug Enforcement Agency will downgrade cannabis from a Schedule 1 drug. Rohrabacher’s comments were well-received by the audience, and he jabbed at the drug war police state that criminalizes the use of a plant. The enlightened Congressman has been hard at work fighting within the system to end the unjust prohibition of a plant with miraculous abilities to treat a variety of ailments. Rohrabacher was instrumental in getting a measure passed that blocked the Department of Justice from using funds to go after medical cannabis patients and businesses in states where it is legal. The amendment, along with others that would have surely acknowledged the benefits of cannabis, were stripped from the bill by prohibitionist lawmakers. Rohrabacher is not the only lawmaker engaging in civil disobedience to challenge state injustice. As we reported in January, Georgia representative Allen Peake admitted that he brings medical cannabis into Georgia from states where it is legal, so he can ease the suffering of epileptic children. These noble lawmakers are standing with the people, and they will be on the right side when cannabis prohibition becomes just another sad chapter in U.S. history.